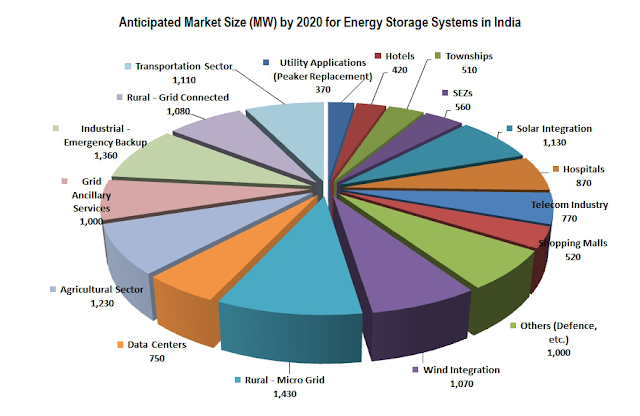 India Energy Storage Alliance, IESA (link) has released the "Energy Storage in India: Market Assessment" report, the 1st of its kind assessment of energy storage market potential in India. The report highlights some of the potential drivers that could lead to the growth of ESS in India. IESA was launched in 2012 to promote energy storage technologies and applications in India by creating awareness among various stakeholders to make the Indian industry and power sector more competitive and efficient. IESA is working towards providing insights to technology developers and system integrators on the policy landscape and business opportunities in India through interactions with key stakeholders. Optimizing the supply and demand imbalance: India’s peak power shortages result in reliance on very expensive diesel power as backup for industries, commercial establishments as well as residential complexes. Supporting the growth of intermittent renewable energy sources: Central Electricity Regulatory Authority (CERC) has mandated forecasting and scheduling of solar and wind farms, thus generating interest amongst the renewable developers on integration of storage technologies to manage financial risks. Introduction of ancillary service markets: CERC is currently working on policy framework to introduce ancillary markets in India with initial focus on frequency regulation. Based on the supply – demand mismatch and the anticipated share of variable renewable resources in the supply mix, various experts at the Regional Load Dispatch Centers (system operators) anticipate that India needs to allocate 2-3% of the generation as frequency regulation resource to improve the grid frequency. Based on the current installed capacity of 212 GW, this could result in a frequency regulation market size of 4-5 GW to open up with in next 12-18 months once CERC finalizes the regulations. Transmission & Distribution (T&D) upgrade deferral: The Power Grid Corporation of India Ltd (PGCIL) has planned to invest INR 1,30,000 crores (US $ 26 billion) in the expansion of the transmission program for the next five to six years in India. Micro grid opportunities for Special Economic Zones (SEZs): Micro grid concepts by integrating various locally available distributed resources for ensuring power availability for the occupants are of interest to SEZs / townships that are drivers of economic growth in India. Rural Electrification: Despite massive rural electrification plans, India has nearly 54,000 un-electrified villages. In most of the electrified villages not only the connected households are a fraction of the total but for many villages power is available for less than 8 hours per day. Off-grid power generation augmented by local renewable energy (wind, solar, bio, hydro) in a micro-grid mode is therefore an attractive option to energize nearly 125,000 villages. Under the Rajiv Gandhi Grameen Vidyutikaran Yojana (RGGVY) 90% grant is provided by government of India and 10% as loan by Rural Electrification Corporation to the state governments. Energy efficiency improvement opportunities in large energy intensive industries: Bureau of Energy Efficiency has launched Perform, Achieve and Trade (PAT) mechanism for improving efficiency of energy intensive industries. It can be feasible to integrate appropriate ESS technology along with other possible energy efficiency measures for the reduction in peak demand and specific energy consumption. Telecom Sector: India has one of the largest telecom markets in the world with over 300,000 telecom towers, majority of which need back up power using renewables. Also there is growing need for backup solutions for data centers in the India to replace diesel generators. Electrifying the transportation sector: Indian government has allocated INR ~20,000 crores (US $ ~4 billion) over the next eight years to promote hybrid and pure electric vehicles, through research and development, infrastructure and subsidies under National Electric Mobility Mission Plan (NEMMP) 2020 with a goal of adoption of 6 million Hybrid (HEVs)and Electric Vehicles (EVs) across various customer segments. Opportunities for ESS can be divided into major customer segments. A technology provider can strategically focus on specific customer segments and gain first mover advantage in those segments. Such as Commercial & Industrial (C & I)sector, SEZs & Townships, Telecom industry, Wind power developers/owners, Solar power developers, Rural electrification and microgrids, Electric transportation, Agricultural sector, Military and Defense sector. Based on the continued economic growth in India and the huge push given by various initiatives by Indian government for energy security, environmental concern, at IESA we did a detailed analysis to understand the potential market for ESS in India. Based on our analysis we estimate a market potential of over 15 GW for all types of ESS technologies (including thermal storage) in India through 2020.